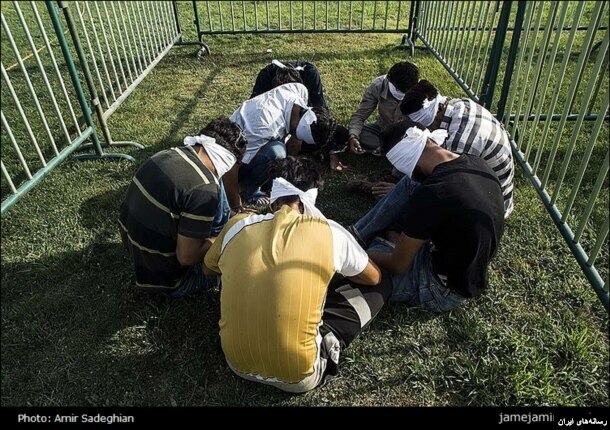 September 11,2016: The Afghan government is protesting Iran’s decision to blindfold several Afghans and put them in cages in the center of Shiraz this week. Nearly two dozen handcuffed Afghan refugees were displayed in a large metal cage. Police also exhibited confiscated items, including weapons, explosives, drugs, alcohol and smuggled soft drinks. The deputy police chief of Shiraz, Nasser Keshawarz, said the refugees were among some 200 foreign nationals who entered Iran illegally and were arrested. Pictures of the public detention went viral on the internet, drawing outrage from Afghans and human rights activists, and an official diplomatic protest from Kabul. The Afghan government is protesting Iran’s decision to blindfold several Afghans and put them in cages. There was no response from Tehran or on official state-run media. Mohammad Reza Khoshak, an Afghan parliament member from western Herat province, which borders Iran, denounced the Iranian regime. “In Shiraz, a city well-known for its poet Saadi, who asks for equality for all humans, my fellow citizens are put in cages and mistreated in a way similar to what militants of the Islamic State do to their prisoners,” he told an Afghan newspaper. Roughly 3 million Afghans live in Iran. Most of them settled there after fleeing war and conflict in their homeland, and many lack basic rights and live without a formal status. About 950,000 Afghans in Iran are classified as refugees. Iran has sent thousands of Afghan refugees, mainly ethnic Shi’ite Hazaras, to Syria to fight alongside forces of Hezbollah and Iran’s elite Revolutionary Guard forces in support of the Syrian government. Dozens of Afghans have died in the Syrian war. In his online post, Hazara asked educated Iranians to fight what he termed a systematic prejudice by Iran against Afghan refugees. In general, Afghans living in Iran try to keep a low profile so as to not anger the regime. “They [Iranian authorities] are very tough on us, and even one of my colleagues got a threatening message to not talk with foreign media about the incident,” Afghan journalist Kazem Sharafuddin told VOA from Mashhad. The caging of Afghans has angered some Iranians, as well. Former Iranian President Mohammad Khatami’s spokesperson, Abdollah Ramezanzadeh, condemned the move.